If you have not made these Healthy Chocolate Chip Cookies yet, stop everything and get to it! 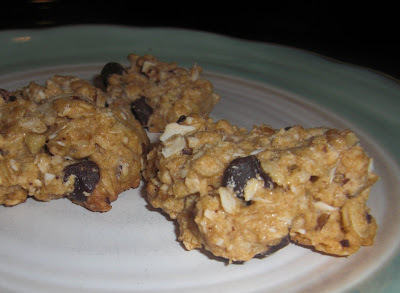 I posted this recipe a while back but they are so easy and delicious and my new modification is worth a re-post. I am just discovering the beauty of cooking with brown rice syrup and barley malt syrup. They are far superior to the agave version. Preheat oven to 350. Mix all ingredients. Drop spoonfuls onto baking sheet. Flatten. You may want to flatten 1/2 way through cooking as well. *I know these have refined sugar, but we allow them as a small vice in our diet! All things in moderation. Be sure to check out the Sugar Cookie Recipe from a while back, they are perfect for Valentines Day cut outs.